Canberrans, clear your weekends! My friends and I took advantage of the Weekend Bliss package as part of the Summerside Festival. 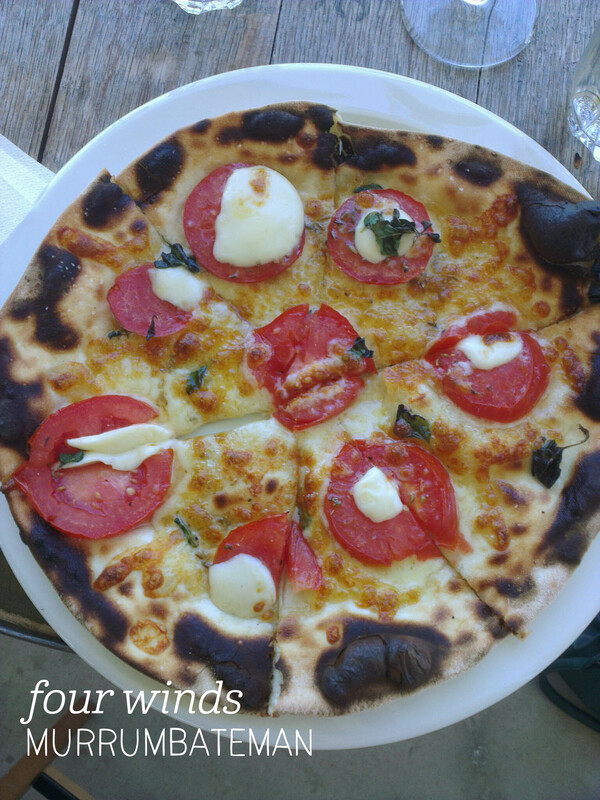 For $36, you receive a glass of wine and a woodfired pizza from Four Winds Vineyard, and a hot chocolate and dessert plate from Robyn Rowe Chocolates – what more could you want? Four Winds has a lovely restaurant space; spilling out onto the lawns in front of the vines are tables on the porch and more tables covered by shadecloth. I chose the 2015 Riesling, which was a great match for the pizza – light, not overly acidic and fresh, it was perfect for a warm summer’s day. There were four pizza choices, but I couldn’t go past the February special of fresh tomato with fennel and garlic sugo, topped with slices of mozzarella (usually $15). The wood oven sits outside so you can watch your lunch cook – our food took a little while to arrive, but was fresh out of the oven when it did. The pizza I loved the charred effect and the fresh burst of flavour from the tomatoes. I would have liked a touch more salt, and the base wasn’t crispy the whole way through, but the subtle fennel and garlic sugo was divine and the mozzarella was a great cheese match for the flavours. A nice part one to our bliss package! Part two to follow on Monday. 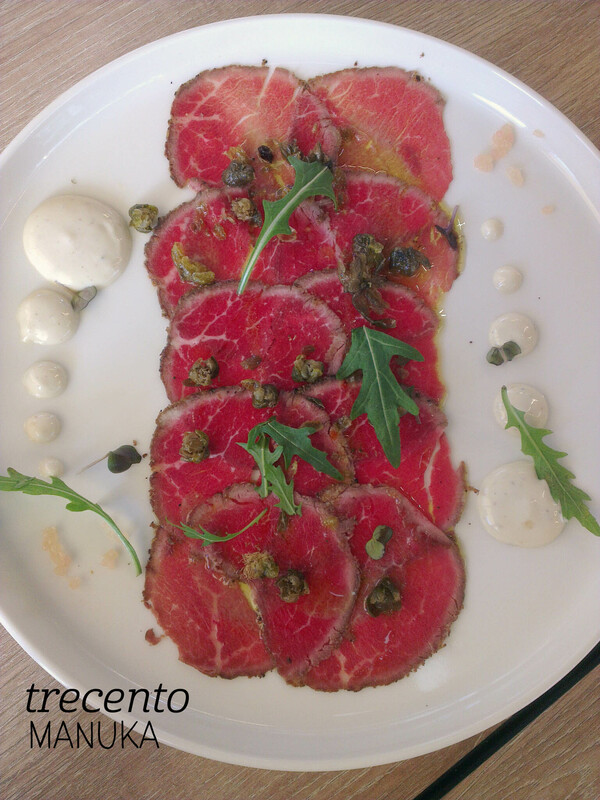 I always like visiting people’s favourite places – it usually means they’ve scoped out the menu, which is exactly what my friend had done at Il Portico. He recommended the Boscaolia pasta (available at lunch and dinner, $20), with porcini mushrooms, Italian bacon and a creamy truffle oil sauce. 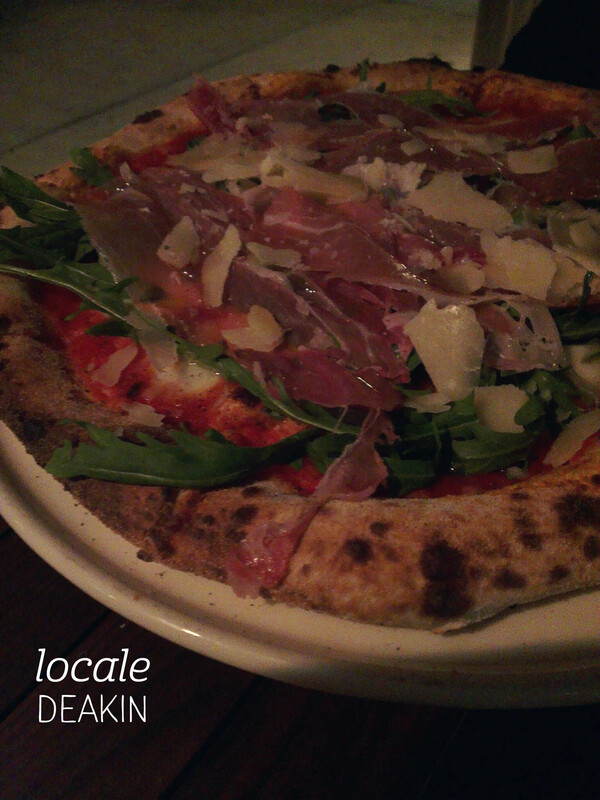 I picked the Proscuitto pizza ($21), with rocket, proscuitto, parmesan and olive oil. Always trust the local. Both dishes arrived together a short interval after we’d ordered. The pasta dish was utterly divine and definitely my favourite. Silky smooth pasta (although not house-made), utterly perfect, salty Italian bacon and seriously the creamiest, loveliest pasta sauce I’ve had in a long time. The truffle oil would have had something to do with that, but I also loved the way that the mushrooms were cooked without shrivelling up or drying out – yum. The pizza was delicious too, with plenty of paper-thin slices of proscuitto, generous amounts of rocket and parmesan, and a not-too-cheesy-or-tomatoey base. The base itself was fairly thin, and had a nice amount of crisp to it. The service was attentive and friendly – this is a lovely spot just back from the Foreshore for a quiet, quality meal. 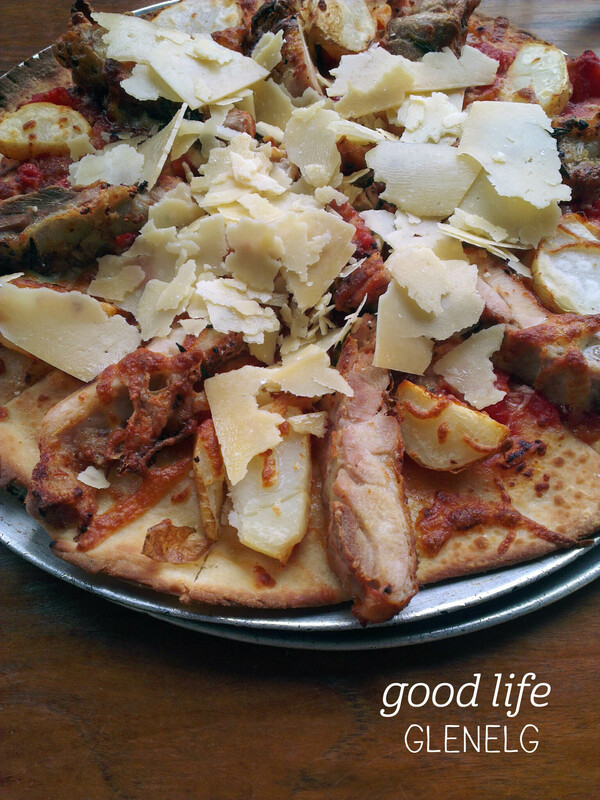 Adelaide has some amazing pizza places, and Good Life is one of the first that I really fell in love with. I’ve been going there for years and always end up ordering the same pizza – it never disappoints! Mum and I stopped in for a weekday lunch and were seated out on the balcony. We got my favourite, the chicken, potato, rosemary and parmesan pizza, to share in the large size ($29.85). The pizza came out fairly quickly and was visually stunning – large chunks of chicken were covered in fresh, not-melted parmesan and golden potatoes. Mmm. The flavour matched the presentation – the chicken pieces were tender and plump, if a little fatty, and packed with flavour, well matched with the subtle sliced of roasted garlic and the infrequent and not-overpowering dottings of rosemary. The pizza base was thin and crisp, especially along the crust, and was nicely seasoned for maximum tastiness. The potato was perfectly cooked, but the highlight for me was that parmesan – I adored the bitey flavour and the generous portion per slice. We couldn’t quite finish the last piece, but gave it a good try. A reliable favourite to keep coming back to! Lunch at Da Rosario has been on my ‘to do’ list for a while – the day we managed to go was blustry and cold, and the staff kindly offered us a seat inside at parent-restaurant Mezzalira to shelter from the weather. The menu is full of temptations, but on a work day we kept it simple – I ordered the spaghetti carbonara and my friend picked the pizza special – tomato and truffled mushroom. Both meals came out quickly and at the same time and looked like good Italian food should – simple. The food here is all about stepping back and letting the flavour combinations shine. 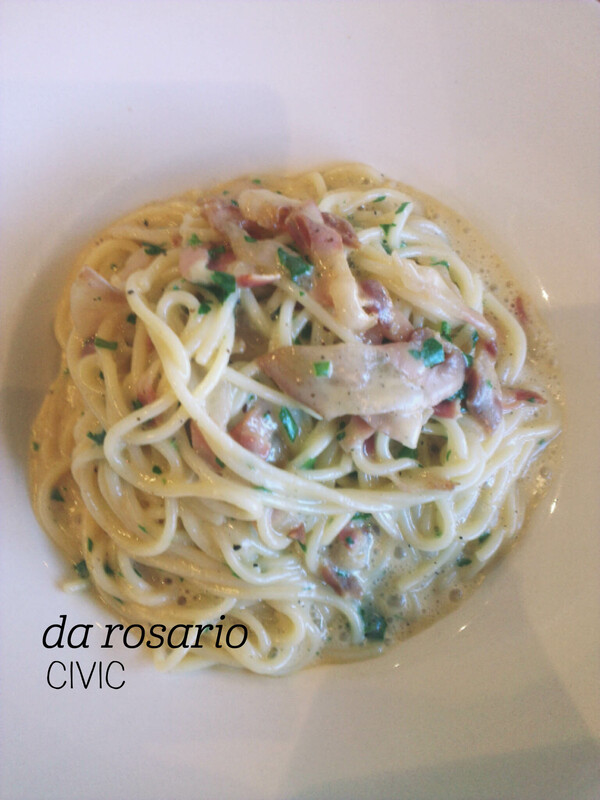 The carbonara was delightfully creamy, but not sickeningly rich, and had cured pork cheek instead of bacon. It was fattier, but lighter too, and added just the right amount of saltiness. The dish used pecorino rather than parmesan, which meant that it complemented, rather than overpowered, the overall flavours. The portion size was generous and filling. My friend’s pizza had a thin, crispy base and minimal quantity/maximum flavour toppings. You could smell the truffled mushroom as it came out. Mmm. Perfect for satisfying an Italian food craving! 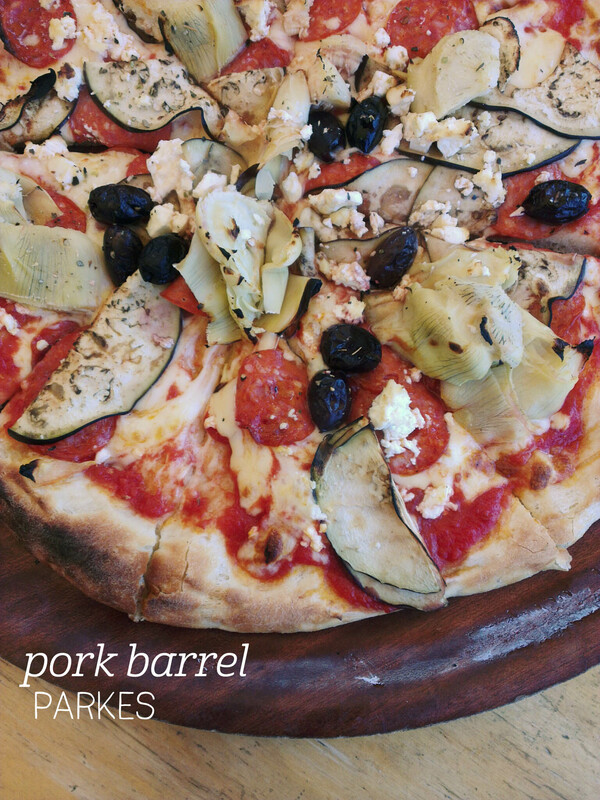 Two-for-one pizzas at Pork Barrel has been a lunch tradition for my whole Canberra life. To be honest, I’ve never tried anything else there! On this visit we ended up ordering two of my favourites – the Bombay (tandoori chicken, Spanish onion and raita), and Continental (artichoke, eggplant, pepperoni, olives and fetta) in the largest size to share. I feel like the bases at Pork Barrel have become thicker, because each piece was far more filling than I remember. The Bombay had tonnes of Spanish onion, much more than chicken, unfortunately, but was drizzled with refreshing raita and had a couple of papadums resting on top. There’s a good kick to the tandoori but it’s balanced by the sweet onion. The Continental had a generous amount of topping, with plenty of delicious pepperoni layered on the bottom, plenty of artichoke and a nice hit of salt from the kalamata olives and fetta. We didn’t have to wait too long for our food, despite being there at peak lunch time, although it took a while to line up and order. Remember to specify that you want two-for-one, otherwise you won’t get the deal! A friend and I managed to get an outdoors table at Locale for a weeknight dinner – the waitress inside wasn’t particularly attentive and seemed a bit befuddled, but the waiter who looked after our table was friendly and professional. We started out with the hot prawns – a bowl full of prawns in a sauce with chilli (deseeded, so not particularly spicy) and tomatos, served with a delicious flatbread. There weren’t many prawns (about 7 in total), but they were perfectly cooked to tenderness, and anyone ordering this dish should lap up every drop of that sauce. Yum. 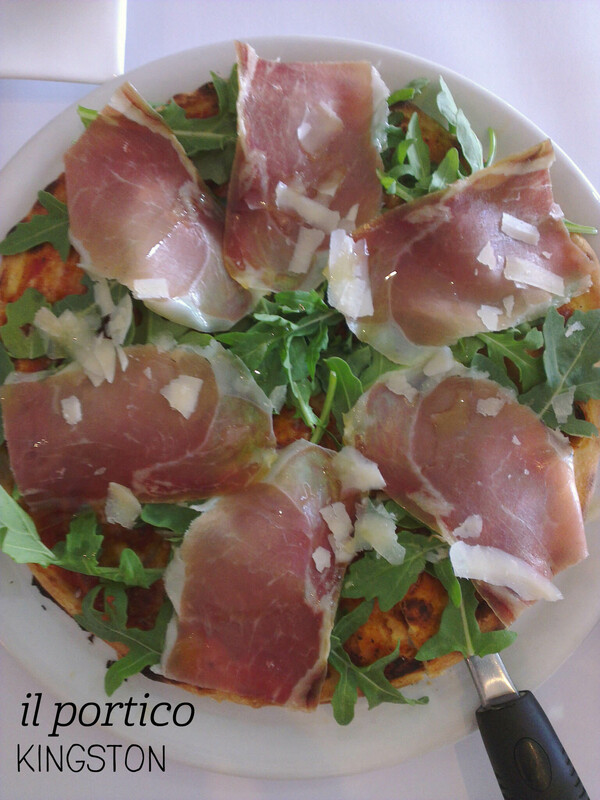 We then shared a Prosciutto e Rucola pizza – buffalo mozzarella, prosciutto, rocket and parmesan. We both commented on how the simple toppings was the hallmark of authentic pizza, and with such thinly shaved prosciutto and scattered rocket and parmesan, it looked to tick all the boxes. Flavour-wise, this pizza was superb – the prosciutto added plenty of salty flavour, which was enhanced by the bite of both the rocket and the parmesan. The base was lovely and thin, and the mozzarella went beautifully stringy! One between two was just right for us and we left with happy tummies.